We continue on with Part 2 of 3 in our review of C. Kavin Rowe's book World Upside Down: Reading Acts in the Graeco-Roman Age. In Part 1 we discussed how the consensus view in NT scholarship regarding Acts is that Luke penned the narrative to show that the Jesus movement was politically inoffensive to the Roman Empire. Luke accomplishes this, it is argued, by having Paul appear before various officials of Imperial Rome and having each vindicate Paul and the movement he represents. The take away appears to be that King Jesus is no political threat to Caesar. Such a take on Acts is bothersome for those wanting to read the NT as an anti-Empire polemic. But is the consensus reading of Acts correct? As Rowe points out in World Upside Down, the political story told in Acts is a bit more complex. While it is true that Paul is vindicated by Imperial Roman officials, it's also true that wherever the gospel spreads in the book of Acts there is violent social upheaval, much of it centered on economics. In these texts the gospel isn't politically neutral but observed to be highly disruptive, something that, well, something that turns the world upside down. 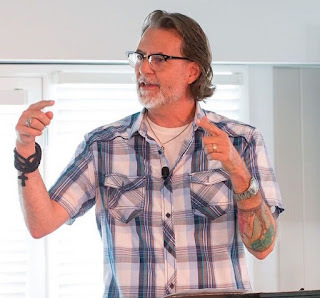 To illustrate this upheaval, Rowe works through a series of collisions in the book of Acts, locations where the gospel crashes into the pagan culture. In each case we see a conflict between the Jesus movement and the culture of pagan idol worship. But before we go on, a clarification is in order regarding idolatry. The turning away [from idols]...was not simply an epistemological act--"knowing better," as it were. Rather, the removal from pagan religious practices, so Luke tells, was a public act with economic and political consequence. [In the story of Acts] to follow the Way is to inhabit the world in a manner fundamentally disruptive to the practices inherent to the present religious order. That such a disruption unfolds economically is but a necessary consequence of the inseparability of ancient religion from economics, or, to put it more along Luke's lines, the primacy of the identity of God for a comprehensive pattern of life. 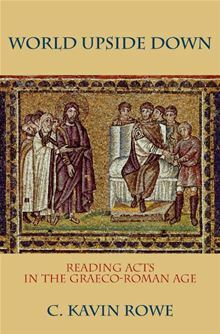 Rowe tracks the collision between these "comprehensive patterns of life" through the narrative of Acts, with particular attention to the events in Lystra, Phillipi, Athens, Thessalonica and Ephesus. The events that transpire in Philippi and Ephesus nicely illustrate of the conflation of religion/idolatry and economics. In Acts 16.16-24 Paul performs an exorcism on a slave girl who is a soothsayer. Upon learning of the exorcism, the owners of the slave girl are thrown into a rage. Why? When this became known to the Jews and Greeks living in Ephesus, they were all seized with fear, and the name of the Lord Jesus was held in high honor. Many of those who believed now came and openly confessed what they had done. A number who had practiced sorcery brought their scrolls together and burned them publicly. When they calculated the value of the scrolls, the total came to fifty thousand drachmas. In this way the word of the Lord spread widely and grew in power. That's 50,000 silver coins worth of magic stuff going up in smoke. A drachma was about a day's wage. Some historians (per Wikipedia) place the value of a drachma (in 2009 USD currency) at $41. If that's right then over two-million dollars worth of magic paraphernalia was burned in Ephesus. About that time there arose a great disturbance about the Way. When they heard this, they were furious and began shouting: “Great is Artemis of the Ephesians!” Soon the whole city was in an uproar. The people seized Gaius and Aristarchus, Paul’s traveling companions from Macedonia, and all of them rushed into the theater together. In reviewing episodes like these in Acts, Rowe points out in World Upside Down that Luke seems keen to describe the social, political and economic disruption caused by the Way. Time after time in the book of Acts, when the Christians show up a riot breaks out. Those who are eager to point out the disruptive and interruptive political implications of the Kingdom just love these stories in Acts. But it presents us with a puzzle in light of the material in Acts reviewed in Part 1. What is remarkable about the exegetical basis for these diametrically opposed interpretations of Acts is that all the different texts to which appeal is made are part of the same narrative...[This creates] something of a pendulum effect, in which the reader of the scholarly literature swings to and fro between passages of putative political innocuousness and purported social disruption. 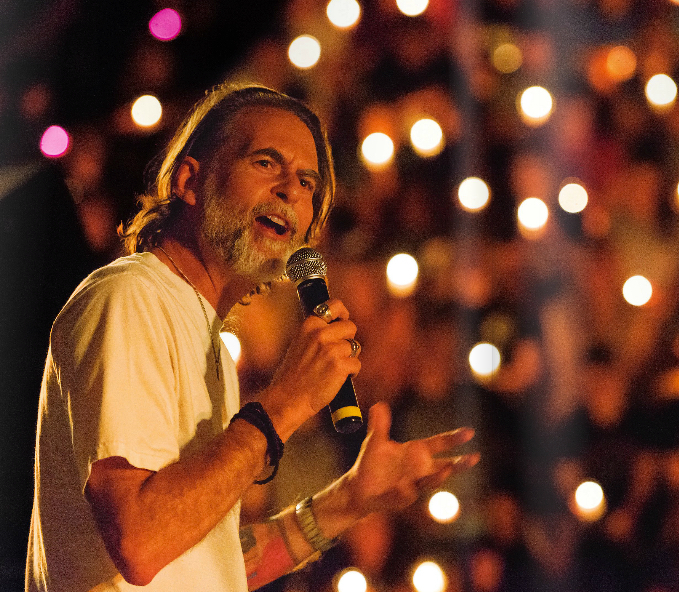 Is the Jesus movement politically innocuous or disruptive? Acts seems to argue for both. So what is going on? I'll summarize Rowe's answer in the next and final post. But feel free to offer your own solution to the puzzle in the comments section. Perhaps "subversive" is a better descriptor? The puzzle is that there is none. While the ground level impact of Jesus followers coming to town is upheaval, the authorities cannot prosecute because they commit no crimes. They don't steal or cheat. And they are not raiding from secluded enclaves. They are hiding in the open. They are also invoking, in their arguments, a theological truth. One which the powers and principalities are woe to confront lest they are dragged into confronting all the gods. Its a virus they cannot attack directly because it doesn't present itself directly. Its not seditious. No Molotov cocktails are thrown and yet it turns the world upside down. No doubt the rulers and opponents of the day prayed that the followers would use violence so that force could be met with force. From your keyboard to the eyes of those who think government can bring about the kingdom of God. I don't necessarily think that the pendulum swing is a "contrived reading," as per qb, because the text is clearly dealing with the topic of political obedience/disobedience and it is perfectly reasonable to try to make sense of the text's position on this topic. But I'd like to say something similar to qb's claim, if a little softer and a little more specific: the seeming ambivalence is a result of the fact that the Acts author's focus is on a different axis entirely. I don't know what the focus is, mind you. But normally (in my experience as an English scholar) when a text seems terribly inconsistent on the topic we're reading for, it's because the text is extraordinarily dedicated to another axis (say, personal ethics or community development or a history of salvation) that doesn't correlate strongly with the one we're studying (in this case, the threat to political order). in trying to answer the question of 'What is our idolatrous religion today? ', I'm sorry if I'll seem a little bit extreme, but I cannot help to think about capitalism (in terms of Benjamin's capitalism as a religion). I'm afraid of the possibility of such a polemic. I kinda think that Peter Rollins' Idolatry of God is somehow connected to that I'm saying. What's the point of this comment? No point. Just a thought I wanted to share.